In reading a Shavian play, one should pay attention to Shaw's staging directions at the beginning of the act. The stage directions here call for the scenery to convey the impression of cheap Viennese pretentious aristocracy incongruously combined with good, solid Bulgarian commonplace items. Likewise, since Raina will ultimately be seen as a person who will often assume a pose for dramatic effect, the act opens with her being (in Shaw's words) "intensely conscious of the romantic beauty of the night and of the fact that her own youth and beauty are part of it." As we find out later, she even listens at doors and waits until the proper moment to make the most effective, dramatic entrance. The title of this play is ironic since it comes from the opening line of (a Roman poet) Virgil's Aeneid ("Of arms and the man I sing. . . .") written in 19 BC. It is an epic which glorifies war and the hero in battle. Shaw will use the idea of the hero (Sergius) in war (the Serbo-Bulgarian war) in order to satirize not merely war itself, but the romantic glorification of war. In addition to this goal, he will also satirize romantic notions of valor and courage, affectation and pretense, and most important, misguided idealism. The dramatic shift that will occur in the play involves two romantic idealists (Raina and Sergius) who, rejecting their original positions instead of marrying each other, will each become engaged to a practical realist — Sergius to the practical and attractive servant, Louka, and Raina to the professional realist, Captain Bluntschli. Raina is seen, at first, as the romantic idealist, but she is also characterized as being a fleeting realist when she wonders if her idealism and Sergius' idealism might be due simply to the fact that they have read so much poetry by Byron and other romantics. Likewise, Raina wants to glory in the noble idealism of the war, but she is also deeply troubled by its cruelty: "What glory is there in killing wretched fugitives?" In this early comment, we have her rationale for her later hiding and, thus, her saving Bluntschli's life. Before meeting Bluntschli, Raina seems to want to live according to the romantic idealism to which she and Sergius aspire. She knows that he has, in effect, placed her on too high a pedestal, but she does want to make an effort to live "up to his high standards." For example, after hearing of his heroic feats, she holds up his photo and "elevates it, like a priestess," vowing never to be unworthy of him. This vow, however, as we soon see, will not last too long. Captain Bluntschli's arrival through the balcony doors is, in itself, a highly melodramatic and romantic stage entrance. In fact, almost everything about Act I is contrived — the lady's bedroom, the concealment of the fugitive behind a curtain, the threat of a bloody fight, the matter of chocolate creams, and, finally, the enemy soldier falling asleep in the lady's bed — all of this smacks of artificiality and is juxtaposed against Captain Bluntschli's realistic appraisal of war and his matter-of-fact assertion that, from a practical viewpoint, Sergius' military charge was as foolish as Don Quixote's charge on the Windmills. And actually, while Raina ridicules Captain Bluntschli for his cowardice, for his hiding behind a woman's curtains, for his inordinate fear (he has been under fire for three days and his nerves are "shot to pieces"), and for his extraordinary desire for chocolate creams, she is nevertheless attracted to him, and even though she pretends to be offended at his comments about Sergius, she is secretly happy that her fiancé is not as perfect as we were earlier led to believe that he was. At the end of the act, Raina returns to her artificial pretensions as she tries to impress Bluntschli with her family's aristocratic aspirations, bragging that her father chose the only house in the city with an inside stairway, and a library, and, furthermore, Raina says, she attends the opera every year in Bucharest. Ironically, it is from romantic operas that Raina derives many of her romantic ideals, and she uses one of Verdi's romantic operas as her rationale for hiding this practical Swiss professional soldier. The final irony of the act is that the professional man of war is sleeping as soundly as a baby in Raina's bed, with her hovering over him, feeling protective about him. 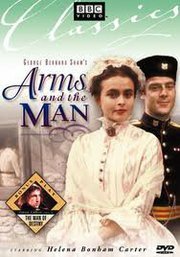 Arms and the Man is an early Shavian play, and in it, Shaw used certain techniques that he was never to use again. In the first act, for example, the entire act has a farcical note about it and the use of a screen or a curtain for a character to hide behind was a traditional technique used only in comedies. The coat episode in the third act is a contrived bit of farce that amuses the audience, but it cheapens the intellectual aspect of the drama because it contributes nothing other than its own farcical element. In Act II, the structure of the act is more serious, but it also uses several traditional farcical elements. For example, there is the use of the exaggerated means whereby Sergius can deceive Raina while trying to make love with Raina's maid, the story told in the army camp about the soldier who escapes into a lady's bedroom (while the ladies of the story have to listen in pretended dismay), the sudden appearance of the captain and the hasty decisions which the ladies must undertake, and finally the sudden surprise that occurs when we discover that Captain Petkoff knows Bluntschli — all of these circumstances are elements of melodrama or farce. In the early part of the act, we see Louka as an ingenious maid who refuses to acknowledge that she has "the soul of a servant," a fault that she accuses Nicola of having. Later, however, when Sergius tells her that she possesses the soul of a servant, his comment stings. We do, however, admire the way that Louka is able to dismiss Nicola and to manipulate the supposedly superior and aristocratic Sergius. When we meet Sergius and hear of his total disillusionment with war and with "soldiering [which] is the coward's art of attacking mercilessly when you are strong and keeping out of the way when you are weak," we are then prepared for the fact that Sergius will not be a romantic idealist for long. His new views on war should prepare us for a significant change in his total outlook on life; thus, he will soon reject Raina's idealistic "higher love" in favor of a more direct love with the attractive and practical Louka, a maid who says forthrightly that if Sergius is going to embrace her, then at least they should stand back where they can't be seen. With Louka, Sergius can admit that there are at least six different people occupying himself and then wonder aloud, "Which of the six is the real man? That's the question that torments me." We now know that the real Sergius is not the one with whom Raina has fallen in love, the one with the "higher love." Thus, by the end of this act, Shaw has set up all of the necessary motives and reasons for Sergius and Raina to break off their engagement and marry someone else. After the farcical bit about the discovery of the old coat in the blue closet, which perplexes Major Petkoff, Shaw then gets down to the resolution of the drama, which involves the revealing of Raina's, Sergius', and Bluntschli's true natures. First, in Bluntschli's interview with Raina, we see him as the practical man who will not let Raina assume any of her poses; he will laugh at all of the poses that she assumes. Captain Bluntschli, while being charmed and captivated by Raina, refuses to take her poses seriously; that is, he delights in her posturing, but he is not deceived by them: "When you strike that noble attitude and speak in that thrilling voice, I admire you; but I find it impossible to believe a single word you say." Thus, Bluntschli forces Raina to reveal her true nature, and she is delighted that someone has seen through her guise and has allowed her to come down off her pedestal. We were earlier prepared for this revelation when she told her mother that she would like to shock Sergius; already, we have seen that she finds "higher love" to be something of a strain on her. Thus, it is ultimately a relief for her to discard all of her artificial poses and finally become herself. Likewise, Bluntschli changes. While he will not tolerate posturing, yet, since he is such a plainspoken man, we are surprised to discover that beneath his exterior, he has a romantic soul — that is, he came back with the Major's coat only to have one more glimpse of Raina, with whom he is infatuated. Therefore, as the practical man is seen to change, so also does Sergius, whom we saw very early in the second act confess to being tired of playing this game of the ideal of the "higher love." He is immensely relieved not to have to be the over-idealized, noble object of Raina's love; he found trying to live up to her expectations tiresome. After discovering that there is no nobility or heroics connected with war, he is delighted to discover that Raina's heroics are not for him; as a result, he turns to the more basic but yet attractive Louka. The resolution of the drama is brought about by the simple technique of having all of the characters recognize their basic nature and yield to it. Consequently, the ending of this comedy is similar to most classic comedies — that is, after a mix-up or confusion between the lovers, everyone is paired with the proper person finally.